Oh man I have been busy. Last Sunday I was up until 6:15 a.m. to get a grant finished. I've been running a marathon ever since - seven state grants due on Thursday and another federal grant due today. But right now, the federal grant is uploaded and received, and the drafts on the other projects are out for review, so I have a few minutes to breath easy! So I thought I'd share these old patterns. I picked them up on a wild run through an antique store last weekend - literally 1 hour after I got my hair cut. 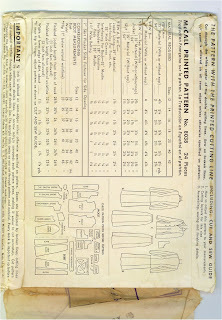 Eight patterns for $8, where can you get a bargain like that? First the apron pattern is really great, isn't it? 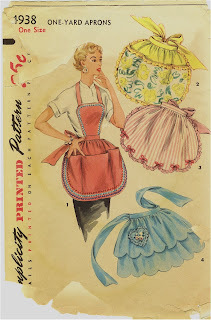 I especially like the pink one with the ruffles. But any of them would be great. The envelope is in poor shape, but it looks as though all the pattern pieces are there and it is not used. 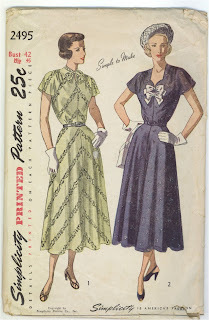 Then there are the two dress patterns. Be sure to click on each of the photos so it will enlarge and you can see more detail. 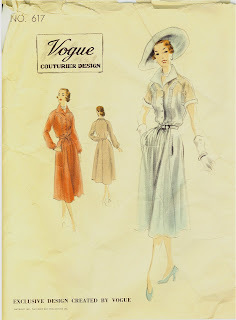 The Vogue on the left is from 1950. It is a raglan sleeve dress with inset pintuck trim - I just love it. How about sea green silk? The Simplicity has no date, but must about the same date. 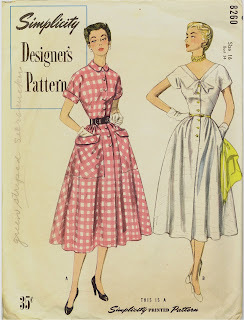 I like the white dress on the right - sort of Lana Turner-ish, isn't it? My waistline would not support such a nipped in silhouette, but, who knows, maybe someday??? Anyway, have a great week and keep on sewin'! With any luck, I will have some time this upcoming weekend to do a bit. Well as I suspected, grant season started in all its craziness just the day after I posted last time. I've been working day and night to meet deadlines coming up in the next few weeks. But right now, I have a littl downtime as I've got everything out to my clients for review. Even though I'm not sewing, I still manage to steal a glance at patterns now and then. These two are patterns I bought off of Ebay back in February, that got buried in my office. McCalls 8038 is dated 1950. Something about that austere grey jacket and skirt just attracted me. I have some silver grey wool that might make it up quite well. Or what about a more luxurious bucle? I hope to make this one sometime in the next year or so. 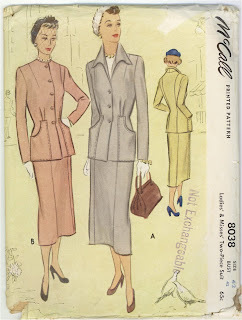 No date on Simplicity 2495, but my guess is about the same age as the suit pattern. I can see the navy dress (without the bows - just what I need, bows to make my chest stick out further!) in a pink cotton sateen or light cotton for summer. I might have to extend those cap sleeves a bit as I don't like to show my fat arms, but it would be great and really retro! Wow, April 1st. The year is 1/4 over already! Who'd of thought it, although it did seem like a long, long winter. I thought this would be a good time to review my 2009 goals, and my progress against them. The original is in plain type, and the progress in italicized. No photos in this one - sorry! + No new fabric purchases!!!!!! + Learn to Quilt on my New Used Quilt Designer Machine!!!!! If you aren't familiar with BurdaStyle, click the title above and you will wing your way to their website. They have patterns for download that range from free to $4.00, and posts from people around the world who have made the piece. 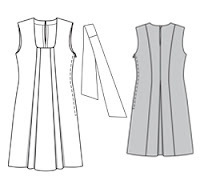 Our fun, simple Kathrine dress is easy to sew and easy to wear. We love the fitted back with pleat and the full, loose movement in the front. Have fun accessorizing it, perhaps with multiple, brightly colored silk sashes, trendy bow ties, or piles of chunky necklaces. The Plus version of the Kathrine has bust darts to better accommodate the Plus figure. The same technical drawing is presented for both patterns. The photos of the plus size version do not show the dress off as well as they could. I'm not certain of how I feel about this dress - I might consider making it, but the way it is shown doesn't thrill me at all. The technical drawing looks interesting, so there may be a possibility there.